Can't attend? Follow Startup Lady Japan to know of future events! Sunset, sangria, a beautiful rooftop, and intellectual conversations —spend your Sunday alongside a community of beautiful and strong women leaders. 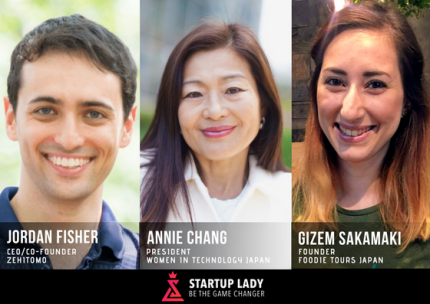 Join us for the 5th Women Entrepreneur Night with special guests Jordan Fisher (CEO/Founder of Zehitomo), Annie Chang (President of Women in Techonology Japan), and Gizem Sakamaki (Founder of Foodie Tours Japan). * 3 drinks and light snacks are included in the ticket price. We’re bridging together a business network of current and future female entrepreneurs and leaders in a friendly and bilingual environment. Participate in icebreakers, share your business journey, join in our different fun and thought-provoking discussions, and meeting like-minded individuals. Let’s support each others’ endeavors while learning and growing together. Calling all professionals (even men!) Both Japanese and non-Japanese are welcome; our event is fully bilingual. * We will be streaming the event on Facebook LIVE. Follow Startup Lady on Facebook. To be to be notified. Limited supply: online sales until 11:59am on Saturday, August 25th or until they sell out. #WENTokyo August edition proudly presents one of our special guests, Annie Chang, Founder of Women in Technology Japan (WITJ). With a background in IT sales, Annie established AC Solutions in 1989, Women in Technology in 2013, and became President of Female Founders in 2017. She will be touching upon her experience and sharing her thoughts on cross-cultural branding. #WENtokyo presents NY born and raised supporter, Jordan Fisherm CEO and Co-founder of Zehitomo. Jordan was Vice President of JP Morgan, Fixed Income Technology, and Japan electronic sales trading company before starting his own venture. Zehitomo, who’ve recently raised 400 million yen in funding, is a customer attraction platform that connects wide variety of professionals, Zehitomo employs many local and international workers consisting of finance, IT, consulting backgrounds. Gizem Sakamaki, the face behind Foodie Tours Japan. Turkish born in Germany, married to a Japanese living in Tokyo since 2015. Gizem is a polyglot, speaking German, Turkish, English and Japanese. Her mixed cultural background enables a deep understanding of intercultural communication, its difficulties and advantages. Foodie Tours Japan is the result of a deep love for food, travel and dedication to hospitality.